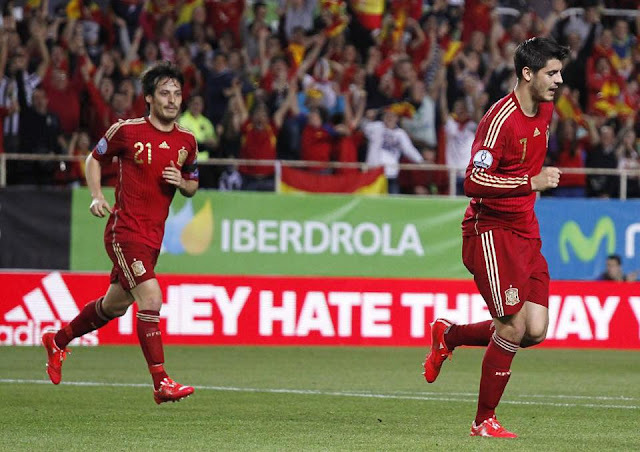 A big week for La Roja in their bid to qualify for the European Championships in France next summer begins with a home game against group leaders Slovakia who beat them 2-1 last October in the Slovakian City of Zilina. Del Bosque has now stopped his experimenting of bringing players into the squad such as Nolito and Vidal for starters and has now decided to pick a squad with more of the experienced and higher quality players. Morata misses out on a call-up due to injury, this squad also sees the return of Juan Mata and Diego Costa to it and there are still the usual names of Silva, Isco, Casillas, Koke, Pique, Ramos, Iniesta, Fabregas and Busquets. This is a very tough game for La Roja make no mistake about it because Slovakia haven't won every game in Group C for no reason, they've done so because they're an improving national side and as they proved in Zilina last October they are more than capable of beating La Roja and can certainly do it again. Okay so Slovakia may not be the most attractive of nations on paper but with players such as Weiss, Hamsik, and Skrtel they have experience and quality and on the counter-attack they are a very dangerous outfit. Slovakia have scored 13 goals and conceded just 3 goals in their qualifying campaign so far and their top scorer is none other than Marek Hamsik with 3 goals from their 6 qualifiers so far and last October he played as a lone striker in a 4-3-2-1 set up. As for La Roja they can be expected to play a 4-2-3-1 which sometimes will look a 4-3-3 especially when heading into the final third and whilst they'll control the game and have the most of the ball they must be aware of the threat this Slovakian side pose on the counter-attack. The De Gea situation cannot be affecting things here either and I hope Casillas starts in goal for this one and that's not because of the De Gea situation but De Gea isn't getting games right now and it's best he doesn't start especially given his situation. De Gea's head must be all over the place right now and he is understandly distraught and I just couldn't risk him being in goal for a huge game like this if I was Del Bosque because La Roja can't have any passengers in this one. Group C is tough for La Roja and their defeat in Zilina last October made it even tougher and when you add Ukraine to this group you've got an extremely tough group on your hands and La Roja must win this game. La Roja do something more international sides should do and that's tour the country and I absolutely love what they do in regards to that and now they head to the Asturias region of Spain and in the City of Oviedo. Oviedo is a city where football is adored and it's backing extremely well, the people of Oviedo absolutely love the game so it's no surprise that the Estadio Carlos Tartiere will be a sell-out for this one with over 30,000 supporters inside on Saturday night. Busquets and Fabregas as the holding midfielders in a 4-2-3-1 set up with Silva and Mata on the flanks as attacking wingers. Upfront I'd go with Alcacer. For me Diego Costa is a very good striker but he doesn't suit this La Roja side and although I feel Del Bosque will start with him on Friday night I do think Alcacer should be the man to lead the attack for La Roja in France next summer. Slovakia's approach to this game is going to be pretty obvious with them putting ten men behind the ball and looking to deny Spain creating any real chances of scoring at all and waiting for the opportunity to strike on the counter-attack and the key man for Slovakia will be winger Vladimir Weiss who has the pace and ability to trouble La Roja defensively if Slovakia get enough counter-attacks started. Saturday night is absolutely massive for La Roja with success in Oviedo an absolute must and failure to get the three points would leave La Roja with an uphill task to qualify from this group it really really would. As for Slovakia they'll be playing in Oviedo with the attitude where a point is deemed a massive success and three points would be sheer delight and an absolute bonus and they'll know that if they come out of September in the top two of this group they'll be in France next Summer and that's a fact. Tuesday night sees September's final qualifiers of Group C until the final two are played in October and La Roja face a trip to Macedonia and to its capital Skopje to face of course Macedonia with a kick-off time of 7.45pm UK TIME and 8.45pm Spanish time and locally. Macedonia sit second bottom of Group C with three points and that one win came last October against bottom of the group right now Luxembourg as they recorded a 3-2 home success and now face La Roja and Ukraine in their final two home qualifiers of this campaign. Macedonia have scored just six goals in this qualifying campaign and conceded 14 goals and were thumped 5-1 against La Roja last September on the East Coast of Spain in the City of Valencia and they won't have forgot that. Macedonia created chances at Estadio Ciutat De Valencia but were comfortably swept aside with ease in the end but still found their way back into the game at 2-0 down as they went in at half-time at 2-1 to give them small hope in the second half but it never turned to reality. I'd like to see Del Bosque rotate a little for this game and I'd like to see players like Vitolo, Bartra, Cazorla, Iniesta, Juanfran, Rico, Bernat and Koke all start in Skopje because it's a game that the back-up players in this La Roja squad can win. La Roja will win this one comfortably and without breaking any real sweat at all but it'll be events in the Slovakian City of Zilina that will make a difference to La Roja's potential fate come full-time in Skopje. I feel that La Roja will just about find their way past Slovakia but it will be a very tough game in which they narrowly win and they'll have to hope that Slovakia can bounce back against Ukraine and beat them because if La Roja come out of September top of this group and six points clear of a third placed Ukraine they'll be virtually guaranteed of a spot in France. I do feel that the final qualifier in Kiev is going to be the deciding factor in this group though and I can't help but feel the trip there will decide La Roja's fate in this group, it's been a tight and close group and it won't end easily for La Roja or Slovakia or Ukraine for that matter and it's likely to go right to the wire.